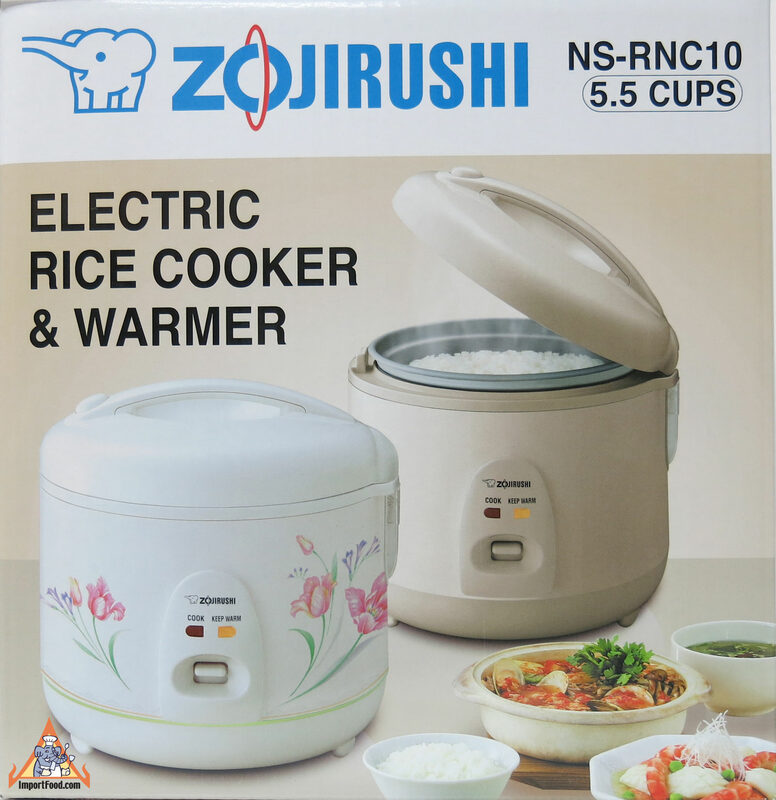 Made in Thailand by Zojirushi, this attractive, modern rice cooker redesigned in 2015 is all you'll ever need. Featuring a timeless "Spring Bouquet" flower design, and solid-state materials to ensure decades of performance. Perfect rice, every time. The 5.5 cup is approx 10 inches tall and 10 inches in diameter. The 10 cup version s approx 11 in. tall and 12 in. diameter. Simply add rice and water, close the lid and push the button. 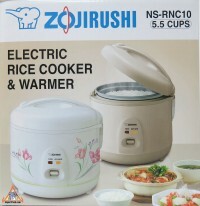 After about 10 minutes the rice is cooked and it switches to "keep warm" mode--the rice stays fresh and warm for hours. 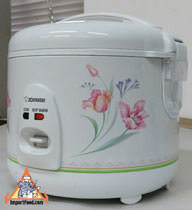 Inside the rice cooker is a non-stick pan that makes serving rice simple, as it never sticks and it's easy to clean. 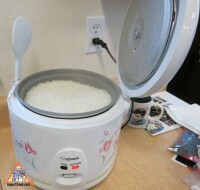 To make perfect rice every time, just open the lid, place a measured amount of rinsed jasmine rice (or other variety) inside, add the same amount of water as rice, close the lid and turn it on. 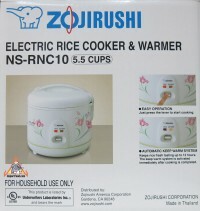 The rice cooker goes to work until the rice is perfectly done, then automatically stops cooking and switches to "keep warm" mode. The rice will stay fresh, moist and warm for up to 12 hours. Notice the nice floral design on the high quality, easy-to-clean shiny plastic surface. Connected to the lid lock mechanism is a convenient holder for the plastic rice serving paddle (included). 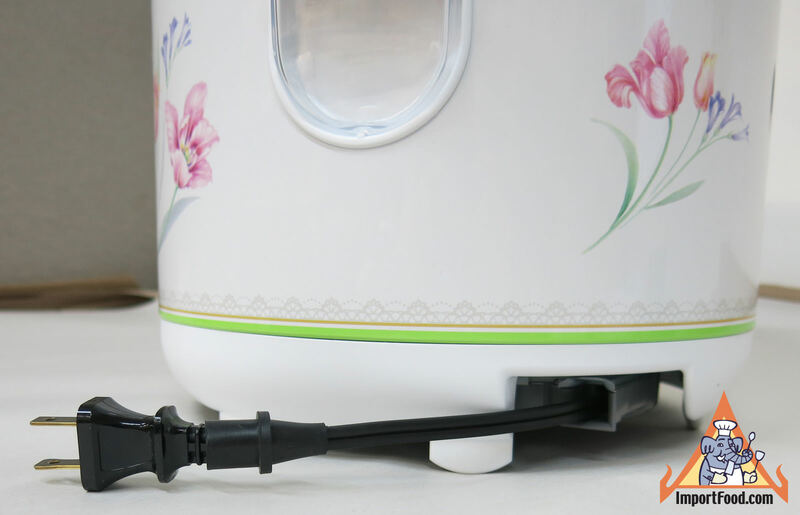 The rice cooker has a domed lid, a new design that helps prevent water drops from falling on rice (so it won't get soggy). Most water drops evaporate before they come into contact with the rice as they flow down the side of the lid. 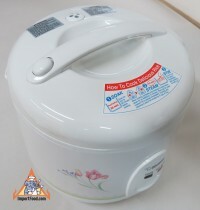 There is also a "moisture cap" on the lid which collects excess moisture during cooking and helps keep adequate moisture after cooking for fluffier rice. 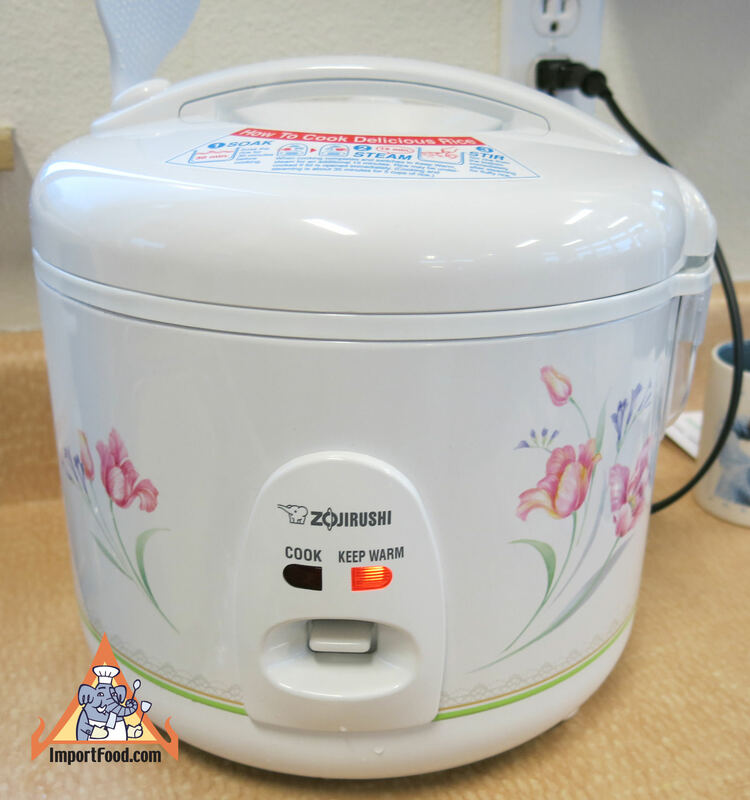 After adding rice and water, all you do is push this button down and relax. 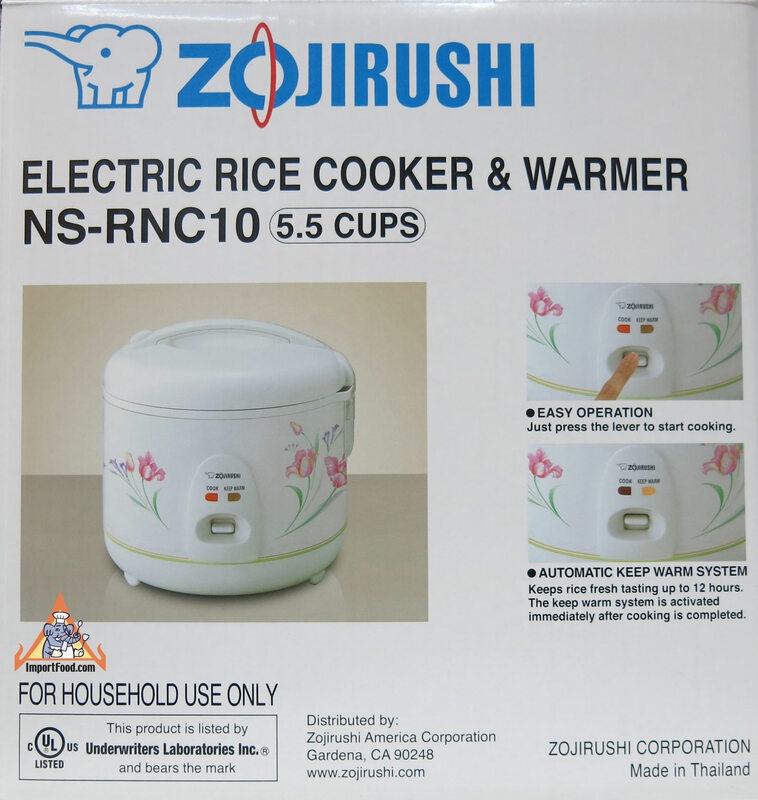 When the rice is perfectly done, the cooker automatically switches to "keep warm" mode. There is a nice long electrical cord that pulls out and locks at the length you prefer, and it has an automatic self-rewinding feature for great convenience. Ever wonder how a rice cooker knows when to turn off? There are a number of appliances that "know" when they should turn off. A rice cooker is one of them. The water-heating portion of a drip coffee maker (as opposed to the burner under the pot) is another. If there is water in a heated container and the water is boiling, the container will maintain a constant temperature. 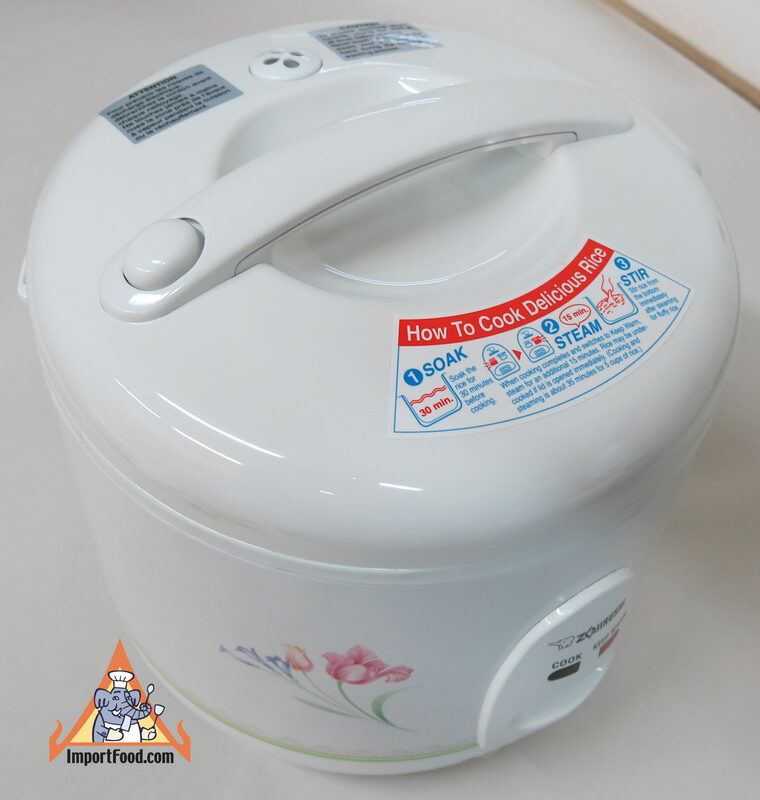 At sea level, the boiling temperature for water is 212 degrees F or 100 degrees C. As soon as all of the liquid water has evaporated (or, in the case of the rice cooker, as soon as all of the water is absorbed by the rice), the temperature inside the container immediately rises. The appliance has a thermostat that can detect when the temperature rises above 212 degrees F in the container, and it turns itself off. Here is a basic fried rice commonly made by street vendors and fine restaurants alike. It's best to use day-old rice that's been cooked and sitting at room temperature (just leave it in the rice cooker for best results). We add roasted chile paste which gives a perfect, authentic flavor which is just a tad spicy.